When it comes to storing pesticides in Nebraska, there are a number of things to consider. One of them is, where should I store my pesticide? For Nebraska pesticide storage, location is a crucial factor and should not be overlooked. Your pesticides should be stored downwind of critical areas such as homes, ponds, and grazing pastures. This practice will protect your environment as well as your community from being contaminated by pesticides and pesticide fumes. Your Nebraska pesticide storage building should be kept clean and well-maintained to prevent contamination. This means that good housekeeping is a must within your pesticide storage building. Practicing good housekeeping skills will help you maintain a clean, well-organized pesticide storage facility – a must for safe pesticide storage. Leaks and spills are easily cleaned and properly disposed of. Housekeeping is just one factor involved with safe, compliant pesticide storage. Your pesticide storage environment should be maintained as well, protecting your inventory and personnel from potential hazards. In Nebraska, pesticide storage compliance requires great consideration and planning. It is important to know the characteristics and hazards of the pesticides you will be storing in order to know the environment they require. Certain chemical characteristics can be found on a pesticide’s Material Safety Data Sheet (MSDS). These characteristics, such as flash point (if flammable), boiling point, and melting point, can help you determine if certain features such as climate control and mechanical ventilation are required for safe storage. An MSDS will also list hazards and incompatibilities, helping you prepare for and prevent hazardous situations. When storing your pesticides on shelves, it is important to use metal shelving, as metal does not soak up pesticides and is easier to clean. Additionally, storing liquid pesticides below dry pesticides will prevent contamination of dry pesticides, should your liquid pesticides leak. Another important safety practice is to keep your pesticides always in their original container. Doing anything other than this is not only a violation of the law, but it is extremely hazardous. The original container is well-marked with a label that details hazards. Any other container poses a risk of consumption by unaware persons. Your pesticides should always be segregated from other materials such as insecticides, herbicides, and fungicides to ensure proper usage of each substance. It most definitely should be separated from seed, feed, and human food for the health of persons and livestock. U.S. Chemical Storage offers fully customizable pesticide storage buildings. 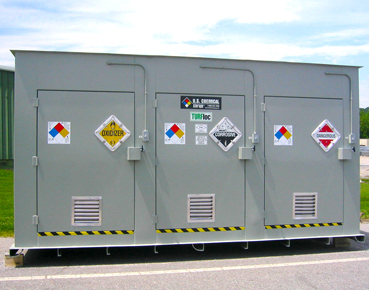 When it comes to safety and compliance our pesticide storage buildings are tailored to your needs. We are dedicated to facilitating the Nebraska pesticide storage process by bringing you the unbeatable security provided by our pesticide storage buildings. A containment sump can prevent leaks or spills from escaping your storage building, while our optional accessories are designed to bring increased protection through climate control, mechanical ventilation, and more. For a safe and compliant Nebraska pesticide storage solution, come see what options are available from the most trusted name in pesticide storage buildings. While this document may cover a number of important compliant Nebraska pesticide storage solutions, it cannot address every single situation for keeping pesticide storage maintained and compliant. Consult your state or local agencies and your pesticide’s MSDS for more information on safe pesticide storage practices.